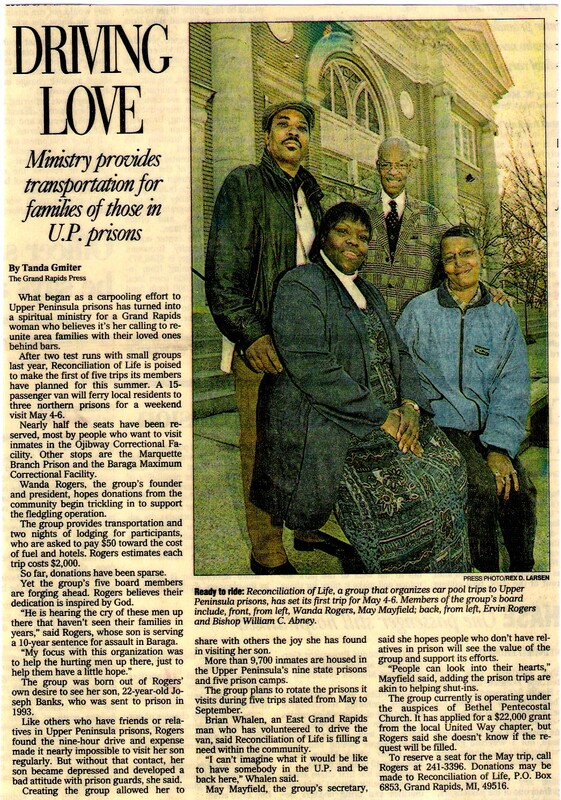 "The History of Reconciliation of Life Ministries"
Reconciliation of Life Ministry was founded in the year of 2000 by sister Wanda Rogers. The name Reconciliation was given to sister Wanda Rogers by none other then Bishop William C. Abney of Bethel Pentecostal Church who also stood as an umbrella for the ministry until it received it's 501 C3 in 2002. The name of Reconciliation 0f Life replaced the former name of People for Prayer Ministry that was founded by sister Wanda Rogers in 1993. People for prayer's mission was to restore prayer back into public schools. 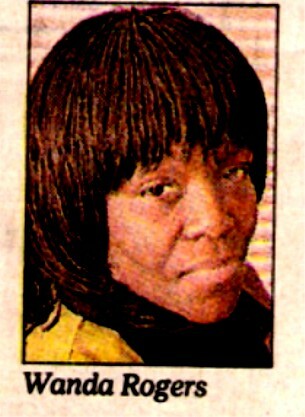 Sister Wanda Rogers begin to have a deep desire to see her son who was serving time in the prison system. Although she tried to block her thoughts of him thinking that she would never get to see him again because he was just to far away from home a miraculous thing happened. God sent word through a letter saying that if she did not get up there to see about her son that they would kill him and call it suicide. Remembering the scriptures of God's word and how it tells us in Isaiah 49:15 "Can a woman forget her sucking child, that she should not have compassion on the son of her womb? Yea, they may forget, yet will I not forget thee." Sister Wanda knew what she must do. She reached out for help from people in high authority but no one could help her. She then went to her boss at the job where she worked. She found out that her boss also had a son in the same prison and she had also not seen her son for a while. She heard he was going through very hard times as well such as Wanda's son. They both soon put their heads together and soon planned to take a trip to go see both sons. This was ROL's first run to the Upper Peninsula prisons as a Ministry. Since founding the program Wanda has arranged five trips to the U.P. with approximately twenty families being served. It has been discovered that a significant number of persons from West Michigan who are serving sentences in the State of Michigan are incarcerated in prisons in the Upper Peninsula or at other facilities at great distances from their families and loved ones. An inmate from Grand Rapids may be 500 or more miles away from home. For many family members and friends, this is a difficult, if not impossible, journey. Unquestionably, such isolation is a hardship to all concerned and also makes the transition to post-prison life even more difficult. These men go through so much distress and hurt. It's important that when it's time to come home, they won't have to bring that distress, burden and sometimes anger of not seeing a loved one home with them. It's important not only for themselves but for the community as well. These trips transport families and loved ones to different penal institutions in the Upper Peninsula. Sister Wanda prides herself on not only being able to provide families and loved ones of incarcerated individuals with visits they never thought possible but also provide room and board with food included at no cost. The Ministry provides transportation to the lower Michigan prisons as well. Sister Wanda Rodgers and the ROL, Ministry worked hard and soon collaborated with churches, prisons and other agencies to help families reunite with each other.